The Magic Princess slot machine is a symphony in purple with all the symbols represented that might appear in a fairytale castle. In this slot you will see the Crystal Ball which triggers the bonus feature if you are lucky enough to get 3, 4 or 5 of them anywhere across the 5 reels. Hopefully the luck will strike you well in this astonishing slot machine with a sure touch of magic. Graphics & Appearance: The display is very clear and detailed on this very feminine slot machine. 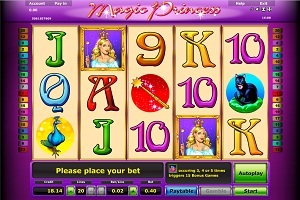 The game window in Magic Princess slot is very easy to navigate. Gamble Feature: The gamble feature in this slot machine is a 50/50 chance. If you win, you will be able to either collect the winnings or to gamble again. You will automatically return to the reels if you lose. Game Symbols: The crystal ball is the scatter symbol and if you hit 3, 4 or 5 of these you will trigger the bonus games. The Magic Princess symbol is the wild and will substitute for all symbols except for the scatter. It will also pay X 2. Other symbols that will appear include a castle, a crown and a cat. The lower paying symbols are the 9, 10, Jack, Queen, King and the Ace. Bonus Feature: The bonus feature on Magic Princess slot machine is free spins that will be awarded to you if you hit 3, 4 or 5 Crystal ball symbols. Betting Options: The Magic Princess allows you to bet on 20 lines over 5 reels. You can set your stake preference by using the + and – symbols. Game Features: You can use the Autoplay function on this game. Simply press the Autoplay button in the bottom right corner of the game window. This button will then change to Stop which you can use to deactivate the function. You will not be able access the gamble feature will you play with the Autoplay function.